Being a Sultan is a stroke of good luck that not many people have these days. But when you play the traditional Vegas game of Sultan’s Fortune Slots, nothing can stop you from feeling like royalty. 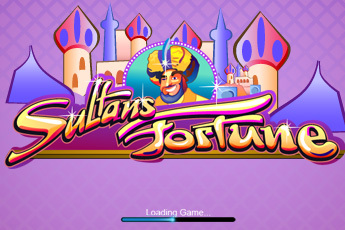 Sultan’s Fortune Slots is a typical three reel, one pay line game that is perfect for some royal gambling. The bets range from $0.05 to $5. It has a simple yet engaging player interface that, along with the designs, graphics and sounds, makes for a great choice when you want to get into the gaming mode. It is also very typical in its theme, which makes it all the more authentic. The Sultan’s Fortune slots has in it the basic royal symbols of a Heart, Gemstone, Gold Coin, Pearls, Top Hat and finally a Sword. The Top Hat symbols acts as a wild symbol and multiplies the winning on the pay line depending upon the wager. The full payout is 10,000 coins, depending on how much you had bet. The game has scrolling text in Arabian, which translates to English, for the continuing feel of being a Sultan. Sultan’s Fortune Slots is one slot machine that will have you living in the lap of luxury.